ROSE WATER is one such thing which has been used in multiple ways in skincare products and remedies. We use it as a toner, homemade makeup fixer, refreshing mist, face masks and what not and every time it works beautifully with just one condition that it must be pure and organic. Now here comes the simplest yet the most complicated question where to find ORGANIC PURE ROSE WATER? Well answer to this is Kama Ayurveda Rose Water. How is Kama Ayurveda Rose Water Different from Rose Waters? 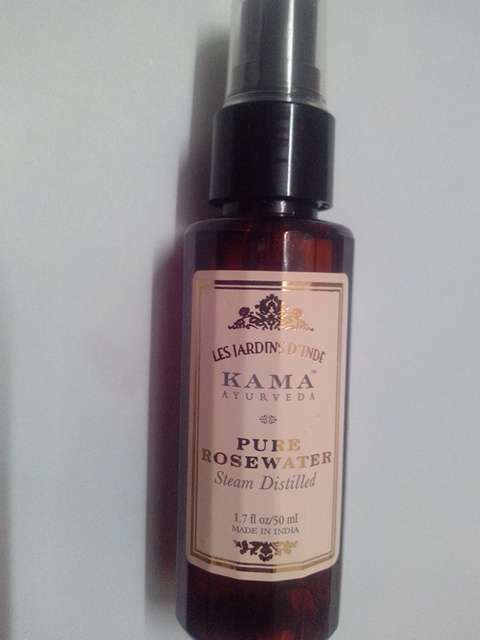 Steam Distilled KAMA Ayurveda Pure Rosewater is made from the roses of Kannauj, a region in North India, rich in white soil conductive to roses' growth. The Kannauj rose is considered special, it has the same specifications as the Bulgarian rose. The steam water distillation process used to create this wonderful rosewater ensures a high level of hygiene and unmatched purity. PRICE – Rs 750/- for 200 ml. Rose water is a natural astringent. It balances and restores skin's PH level and helps tighten pores. Rose water is also a good non-alcoholic toner. 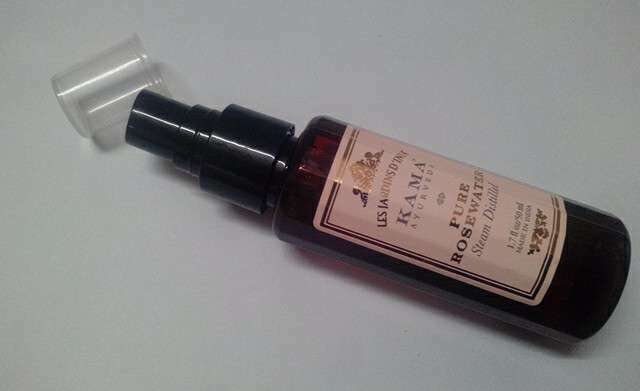 Kama rosewater is a good non-alcoholic refresher that helps remove the residue of the previous cleansing procedures such as removing of makeup. It refines the pores and tones the skin making it ready for moisturizing treatment. It can also be used to damp skin before applying Kama Natural Plant Mask (Lavanya) or Kama Miraculous Beauty Fluid (Kumkumadi). This can also be used as an aftershave. PACKAGING - The best thing about this rose water is its packaging. I feel when there is a product which is required to be used daily that too several times a day, then its packaging needs to be very user friendly and convenient to use. This rose water comes in a beautiful brown semi transparent spray bottle which releases just the right amount of water without any wastage and is super travel friendly since it does not spill and is available in different sizes to choose from. 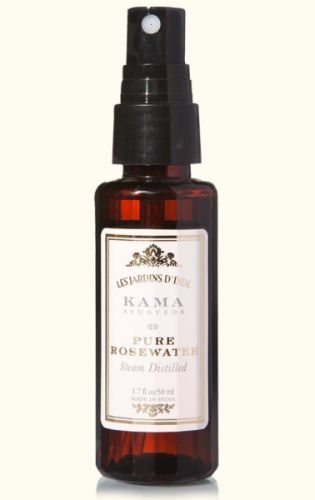 I use this Kama Ayurveda Rose Water mainly as a refreshing mist in summers when I am back from a tiring hot day. Spraying this on face immediately relax your tired senses with the beautiful rose aroma. The aroma is purely natural without any artificial fragrance and one who likes Rose fragrance, is surely going to love this one. I normally keep my rose water bottle in refrigerator because it gives an amazingly cooling effect when used on dull tired skin. This makes me use this wonderful refreshing water even more because of the cooling effect it gives in hot summers. Overtime this rose water has made my skin more smooth and soft. Nothing much of the difference is skin appearance but yes it definitely freshens up my face immediately when I use it on my dull tired looking face after back from hot summers. This is a must bottle for all to have in our carry bags specially in these hot summers to protect our skin from sun damage and also to give ourselves a refreshed feel with just one press. The only downside of this Kama Ayurveda Rose Water is that it’s little expensive, but still worth it if you can't handle the mess of making an organic one of your own. Pure and organic quality rose water. Hygienic rose water made using steam distillation. Free of chemicals and parabens. Gives a very refreshing feel to face. Gives a cooling effect when kept in refrigerator in summers. Packaging is very user friendly and travel friendly. Protects from sun damage when used in sun. Not to easily available offline. I love this rose water. It has become my go to product this summer.